The Fleurieu Peninsula is only a hop, skip and jump away. Access by road is less than 30 minutes from the southern metro areas of Adelaide. 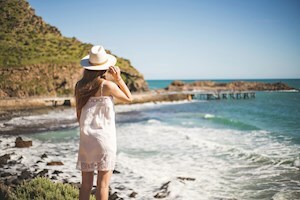 The Fleurieu Peninsula is a place where small intimate villages are nestled in the folds of its hills and historic townships hug its beautiful shores, all within an easy and beautiful drive of one another. 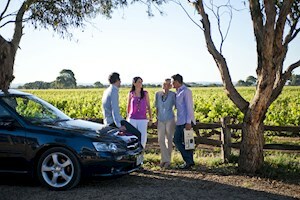 Travel from Adelaide using the Southern Expressway, via McLaren Vale – the Gateway to the Fleurieu. Access from the Adelaide Hills using the South Eastern Freeway via Echunga to Meadows, or via Mt Barker to Strathalbyn. There are also many scenic drives through the hills by way of minor sealed roads. Travellers from the eastern States can enter the region via a free ferry across the River Murray at Wellington. It operates 24 hours a day with only a short wait between crossings. An interpreted touring route, the Fleurieu Way, circles the Peninsula, linking the Great Ocean Road and the Adelaide metro area to the Fleurieu. More info about our Self Drive Touring routes. 2WD is suitable for travelling throughout most of the region. Many beaches allow vehicle access, such as Moana, Silver Sands, Sellicks and Aldinga. For the Coorong National Park and Goolwa Beach you need a 4WD. Some sections of Deep Creek Conservation Park are also restricted to 4WD access. Check signage and conditions prior to entry. There are hire cars available in the region – contact the local Visitor Information Centres for details. Also check with local RAA offices. Alternatively, you can pick up a hire car from a number of city and airport locations. A number of bus and coach operators run regular services from Adelaide to towns in the Fleurieu Peninsula. South Australia's public transport system, Adelaide Metro, also operates a service from Adelaide to McLaren Vale and Strathalbyn – for more information phone 1300 311 108. 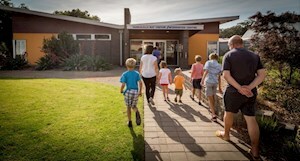 There are also morning and afternoon coach connections between Adelaide and Cape Jervis to meet the Kangaroo Island ferry. There are scheduled drop offs en-route at Aldinga, Goolwa, Myponga, Yankalilla, Normanville and Second Valley. For timetables visit SeaLink. There is a daily bus service from Adelaide to Goolwa that passes through Noarlunga Centre, Mt Compass and Victor Harbor. Visit LinkSA for more information. There are metropolitan public train services operating between Adelaide and Noarlunga Centre. Make the journey an experience in itself, travelling through the Fleurieu Peninsula via the SteamRanger Heritage Railway. Travelling between Mount Barker and Victor Harbor, you can journey aboard a number of different heritage steam and diesel hauled tourist trains. Once in the region you can also travel aboard the historic Cockle Train between Goolwa, Port Elliot and Victor Harbor. For more information and a timetable visit SteamRanger Heritage Railways or call 1300 655 991. The Fleurieu Peninsula has airstrips in Aldinga and Goolwa, which are used by private and charter aircrafts. Adelaide Airport is located 15 minutes from the Adelaide CBD and around an hour's drive from the Fleurieu Peninsula. For more details on how to travel around the Fleurieu Peninsula, contact a local Visitor Information Centre.